UPDATED: Wed., April 11, 2018, 8:53 p.m.
OLYMPIA – Washington’s legislative session is over but the conversation about sexual harassment at the state Capitol continues, with the House and Senate each convening groups to discuss potentials codes of conduct and how to address complaints. The #MeToo movement has swept through statehouses across the country, including Washington’s, where revelations of misconduct at the state Capitol emerged in recent months and where two House lawmakers are under increased scrutiny following misconduct allegations. Since November, more than 200 women – including lobbyists and a bipartisan group of more than 40 lawmakers – have signed a letter calling for a culture change at the Capitol. Separate work groups in the House and Senate are working on recommendations for policies and procedures related to training and reporting procedures at the Legislature. Currently, reports about harassment are not released by the Legislature, which asserts that many legislative documents are exempt from the state’s public records act – and media groups filed a lawsuit over the issue last year. That case is under appeal after a court ruled that lawmakers are subject to disclosure. House leaders last fall acknowledged that former Democratic Rep. Jim Jacks, who resigned in the middle of the 2011 legislative session, was forced out because of allegations of inappropriate behavior toward a female staffer at an event away from the Capitol. Currently, an independent investigation into Democratic Rep. David Sawyer related to alleged unspecified inappropriate behavior is ongoing, and House leadership has said that his contact with staff has been restricted. Several politicians in his home county said in a letter this week they won’t support him in his re-election bid, including fellow Democratic House members. 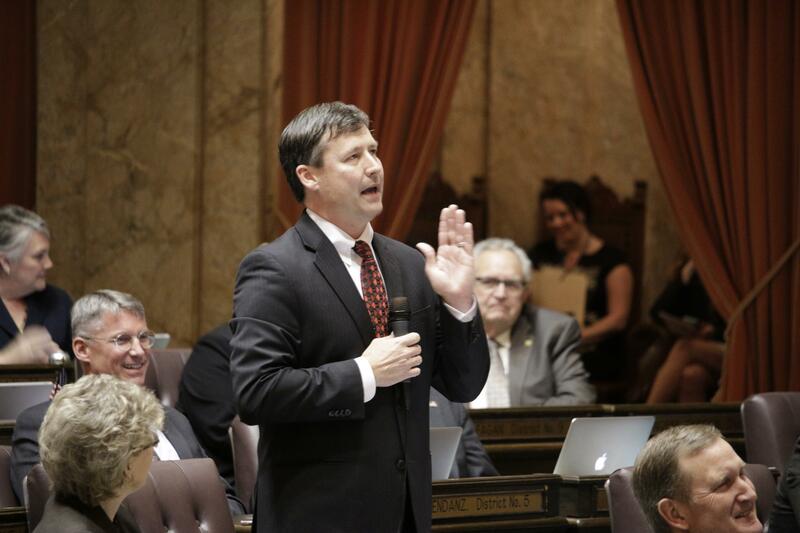 And Republican Rep. Matt Manweller, who is on paid leave from his job as a professor at Central Washington University while under investigation there for allegations of inappropriate conduct, was removed from his ranking member position on a House committee, and resigned his position as assistant floor leader in December. Sawyer and Manweller have denied acting inappropriately. Hendrickson said that recommendations from the Senate group, which includes legislative assistants and professional staff from both parties, as well as a nonpartisan committee staffer, could come as early as the end of June. Two lawmakers, Democratic Sen. Manka Dhingra and Republican Sen. Ann Rivers, serve as advisers. The House has created its own work group that comprises 29 people, including staff, lobbyists and lawmakers, and is expected to hold its first meeting later this month. An internal House group had already been working on updating the chamber’s overall workplace harassment rules since last year. One of the issues that both Senate and House members have said they’ll look at is the potential of an external entity that could be a point of contact for people who want to report harassment. “People are not reporting because they don’t trust reports will be really vetted, that there will be consequences to harassers and that careers won’t be ruined,” said Democratic Rep. Nicole Macri, a member of the House work group. Published: April 11, 2018, 8:44 a.m. Updated: April 11, 2018, 8:53 p.m.